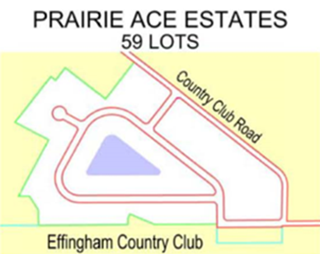 Prairie Ace Estates Subdivision is being developed by Prairie Ace Estates, LLC. This new fifty-one acre subdivision located on the North side of the Effingham Country Club will feature fifty-nine lots for residential development, condominiums, town houses, and duplexes, giving residents several options. Prairie Ace Estates Subdivision will offer EJ Water, Innovative Wastewater, Norris Electric, Ameren Gas, and fiber utilities for telephone and internet. The subdivision features country living while being just a couple minutes from a round of golf and quick, easy access to the City of Effingham. Milano & Grunloh Engineers, LLC provided preliminary and final platting, and design and permitting of the water, sewer, and streets for the project.